The British miners’ strike of 1984 to ’85 was a wholly divisive and socially transformative industrial action that threatened to paralyse the country and bring down Margaret Thatcher’s government. It was the last great battle cry of the socialist unions, fed up with the Tory diktat of rampant privatization of British industry but ultimately one that served to signal the end of overt unionist power. The struggle was pitched as “Arthur’s army” (after influential National Union of Mineworkers’ leader Arthur Scargill) versus the enemy within, a vicious moniker coined by Thatcher to describe the striking miners. 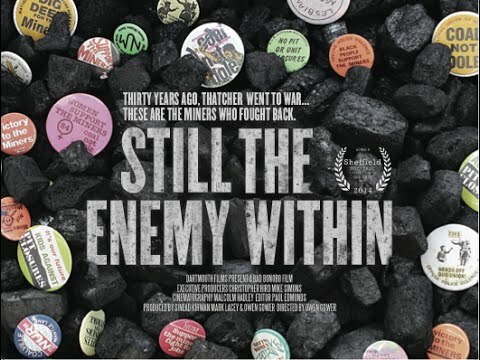 “Still the Enemy Within” is the unashamed and wholly single-minded story from the miners’ perspective of those dark days that came to define Thatcher’s decade-long reign and that changed a country forever. Where Owen Gower’s compelling documentary excels is in giving a voice to a number of those miners who fought so vociferously on the frontline of the strikes for their livelihoods. Of course, their perspective is one-sided, but it’s refreshing to hear it at all. This was a strike that won little support from the media at the time, labelling the striking miners as thugs with only their self-interest at heart. Yet when the delectably named Norman Strike and others speak about their experiences, the pride, solidarity, camaraderie and unwavering belief in their cause shine through just as strongly 30 years on. While Thatcher is cast as the villain — a catalyst of change for the worse — the miners are portrayed as an organized and effective political force, one that had already led to the demise of Edward Heath’s government in 1974. In order to convey the narrative that led to the 1984-’85 strike, Gower makes good use of archive footage that outlines in precise detail the context of the politics of the preceding decade. From the fall of Heath to the formation of the hated Ridley Plan and the appointment of government hit man Ian MacGregor as head of the National Coal Board, all the ingredients that were designed to shut mines and sound the death knell for the British coal industry are laid bare. Gower also affords lesser, unheralded groups such as women and the lesbian and gay movement, their dues for the important role they played in the fight. This was a cause that while divisive on a societal level, bought together disaffected and downtrodden segments of society that had never shared a united front before. In fact, it transpires that the miners were their own worst enemy, with vast regional disparities in working conditions resulting in swathes of the countries miners continuing to work to the chagrin of the majority on strike. Nottingham comes off worst, labelled scabs for defying the picket line and representing their own interpretation of an enemy within. Victory relied on unity; and their refusal to join their comrades was a significant threat to those aims. Ultimately, this internal dispute led to an escalation of violence from both sides, as strikers sought to intimidate the refuseniks into striking and the police adopted heavy-handed tactics, particularly at the infamous Battle of Orgreave. This melee represented a startling turning point in the narrative of the strike. With a media portraying the strikers as an unruly mob, there emerges a sense that this is a fight that the miners can’t win. Emotional reflection on that realization belies that fact, with the positivity of the early days — described as an incredible time — giving way to acceptance of inevitable defeat, particularly with the bitter winter fast approaching. Further setbacks, particularly a missed opportunity to close every pit in the country by forcing the National Association of Colliery Overmen, Deputies and Shotfirers on strike were the nail in the coffin. Broken into submission and with cold and poverty forcing many strikers back to work, there is a real sadness at the failure to achieve their goals that still exists within the likes of Mr. Strike and Paul Symonds. For them, the strikes failure spelt the death of British industry; the fact that pit closures on a massive scale began almost immediately after the strike ended legitimises that standpoint. Despite that, there remains an unbridled defiant spirit amongst those that fought, at great cost to themselves and their families, for what they believed in. Invariably, with a stance that so firmly advocates and presents only one side, there is a sense that “Still the Enemy Within” is far from the whole story. While Gower provides sufficient context to set up the narrative of the strike, it would be beneficial to afford a perspective from the other side. Of course however, that was never Gower’s aim. For him, that side was the one the media and the government forced on us 30 years ago. This is the miners’ story, their right of reply, their moment to reflect on a lost battle that so affected their lives. With that firmly in mind, this remains an insightful, fascinating and revealing piece of work that serves as a timely reminder of the potential power of people as a force for change.